1888 A Clock. London. East End. Time is literally running out. A gentleman explorer journeys far from home and discovers a brilliant young immigrant girl as she desperately tries to keep the cogs turning. They are forced to choose the world they know or each other. Set against a backdrop of immigration, exploitation and technological innovation this visually stunning and emotionally gripping opera takes you into the dark world of the clock that is the beating heart of the East End. 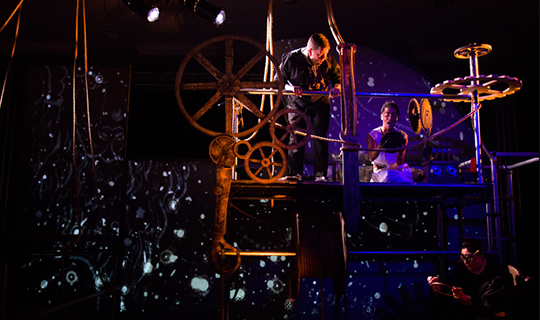 Clocks opens the borders of opera by drawing on the influences of the classical Indian tradition, music hall and musical theatre creating innovations in form between live performance, music and animation. We believe opera is the ideal medium to tell this story as its heightened form is capable of scale and spectacle and also great emotional intimacy. 2013 invited to be part of Barbican Pitlab supported by Barbican. 2014 in association with Hackney Empire supported by Arts Council England, Royal Opera House, University of East London.